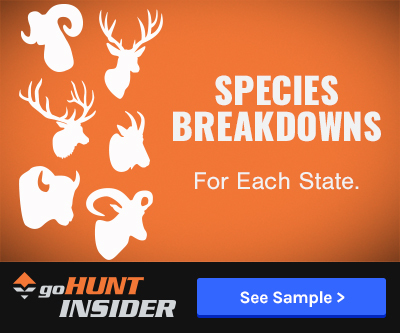 Are you giving away your hunting locations? So you just shot another great buck and can’t wait to get back into cell range to spread the news of your success. You stop at the first town on your way home and text some friends a few photos and mass email a few other hunting buddies really quickly. Since you can’t wait to share them online, you jump on social media and make a post on Facebook and Instagram. You’re on cloud nine and rightfully so. This is your third buck in a row in your honey hole you worked hard to find. The following year you are headed back to your honey hole after another great summer of scouting. You found another giant buck and it's finally the start of the next hunting season. You arrive at the very remote area and park your truck before noticing some extra vehicles (which is odd because it is not a trailhead). You start hiking in and notice your spot overcrowded with hunters. How could this have happened? Could it be dumb luck? Or have you unknowingly leaked out your spot? How are people stealing your hunting spots? Technology is very powerful. Every year we have more and more devices that are able to produce AND share location coordinates. The list is growing: cell phones, digital cameras, watches, satellite messengers, etc. With your cell phone’s or digital camera’s GPS signal turned on, people have the ability to find the exact location the photo was taken from. When you take a picture with a digital camera or cell phone, the file records EXIF (Exchangeable Image File Format) metadata information. This recorded information can include date, time, camera model, camera settings (exposure, focal length), GPS location, etc. 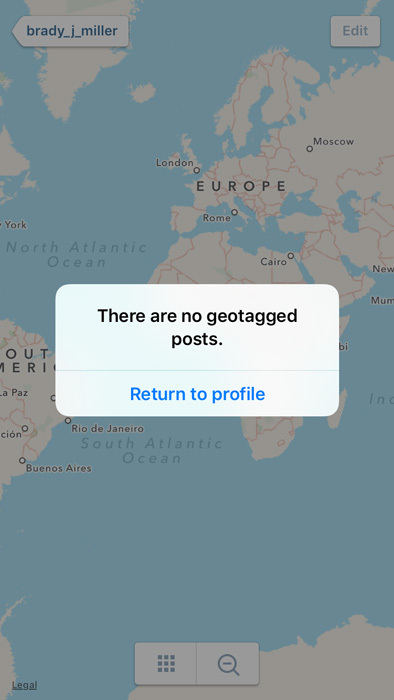 This information is commonly used for geotagging on social media applications (Facebook and Instagram). People can then view where your pictures were taken on a map by simply entering in the coordinates. Unbeknownst to you… you could easily be doing all the work of researching the location, scouting, patterning and hunting a certain animal… and you’re theoretically giving some other hunter a huge helping hand by giving him access to your information. People commonly chase dead deer (try to hunt the same unit a giant buck was killed), but this goes a step further by giving them valuable location information. 2. Photos sent through email. 3. Photos you upload to your personal blog website. 4. Social media (Facebook, Instagram). Something as simple as a photo you texted can provide location information. That text message photo could be forwarded on to multiple people. It eventually might land in someone's message stream. They send the photo to their computer and then open up the file information to reveal your GPS location coordinates. Download the image to your computer, right-click on it, select Properties, and then click the Details tab. Look for the Latitude and Longitude coordinates under GPS. Download the image to your computer, right-click on it, and select Get Info. You’ll see the Latitude and Longitude coordinates under More Info. If you click on the file information and don’t see anything, they have been removed or never included in the photo. Many online photo hosting services will automatically strip the geolocation details as a way to protect privacy. If you have a newer cell phone, anyone can steal your hunting spot. With location information enabled, your smartphone embeds GPS coordinate location metadata with every photo. Note: most cell phones have this enabled by default. A hunter who is jealous of your success can in essence “steal” your hunting spot by looking at your photos’ metadata to find out where they were taken. All they have to do is save the photo to their computer and view the file’s properties to look for it. Then, they can simply enter these coordinates into a mapping service to see the exact location you took the glassing photo or the harvest photo. If you are serious about protecting your hunting location, then my suggestion is to disable this entirely on your phone and digital camera and not rely on a third party tool on your computer before you upload. You can always select individual applications and decide if you want to share location information or select "While Using" so you can still use a mapping device while traveling. 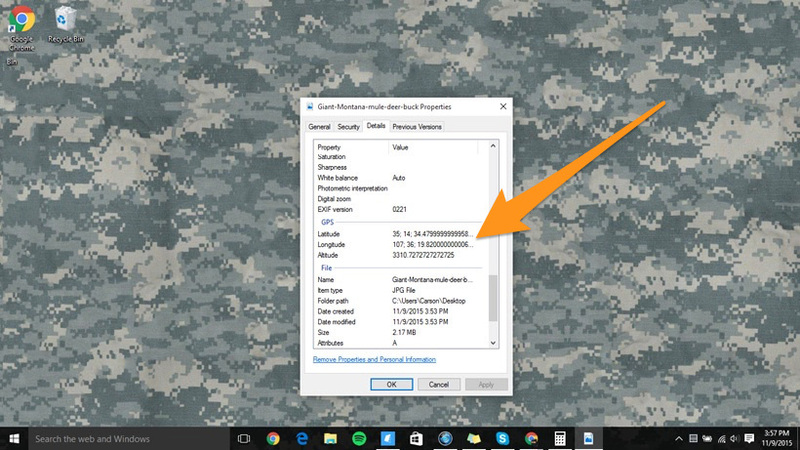 If you have a bunch of photos on your computer with location information, there are tools out there that you can download for Windows and Mac to remove location metadata. Removing the location information for individual applications. 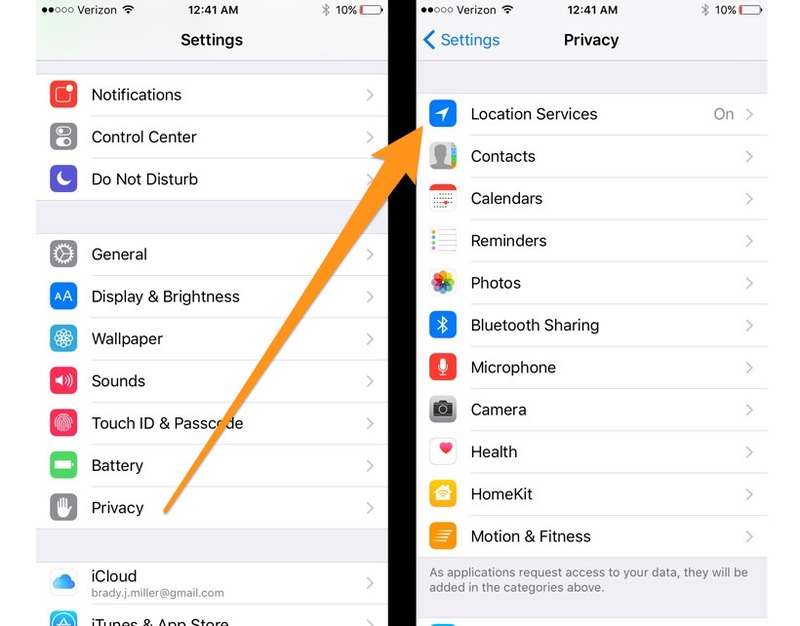 If you’re using an iOS device, open your settings and tap Privacy controls. Next, select Location Services. You can turn location services off for everything or select individual applications. If you see this image above with the colored slider to the right, that means your location service is turned on for that application. If you see this image above with a white slider to the left, then locations services are currently turned off. I suggest selecting the Camera applicaiton and then selecting Never for allowing location access. In my opinion this is one of your greatest protections against sharing your location. Your phone camera will no longer embed your GPS location in your photos. Unfortunately, this process varies from phone to phone. Different manufacturers include their own custom camera applications and each version of Android’s camera application works differently. 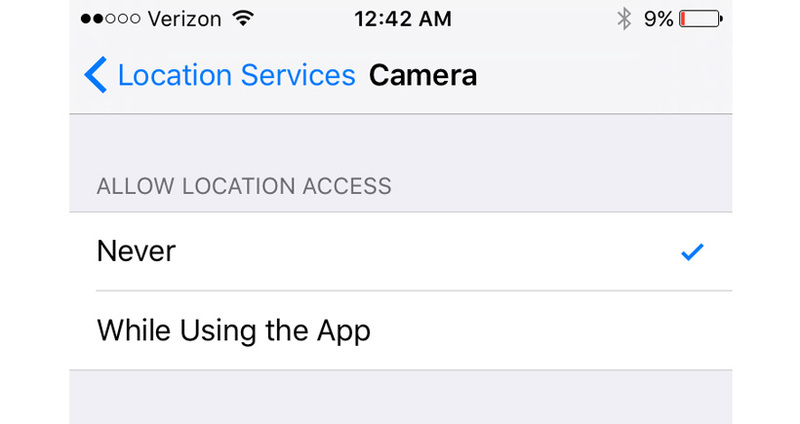 Dig around your camera app’s quick settings toggles or settings screen and look for an option that disables this feature — or just perform a quick web search to find out how to disable it on your phone and its camera app. Luckily for hunters, Facebook automatically strips most metadata from your photos you upload from your computer and cell phone to photo albums. The exception is when you allow Facebook to mention where you are posting the photo from. A simply solution is to stop posting your location when you make status updates while hunting. If it shows up… click the “x” next to your status on the city location. Another location service you need to turn off is in Facebook’s Messenger app. 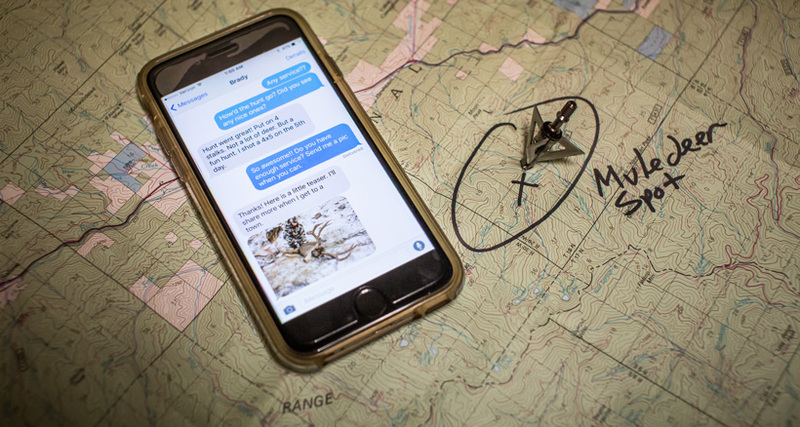 This messenger could showcase your location to anyone you chat with while sitting on a mountain. You can change these settings in your Facebook application on your phone. 1. Tap the "hamburger" more icon. 2. Scroll down, tap Settings and select Account Settings. 3. 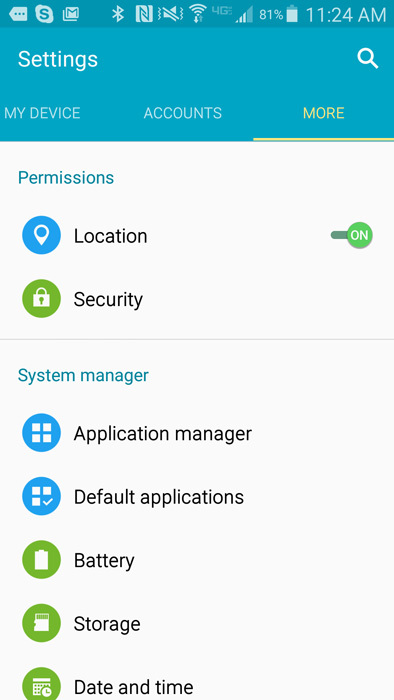 Under your Device Settings, tap Location to enter your phone's location settings. 6. Select Location History and turn that feature off, too. 2. Scroll down and tap Account Settings. 4. 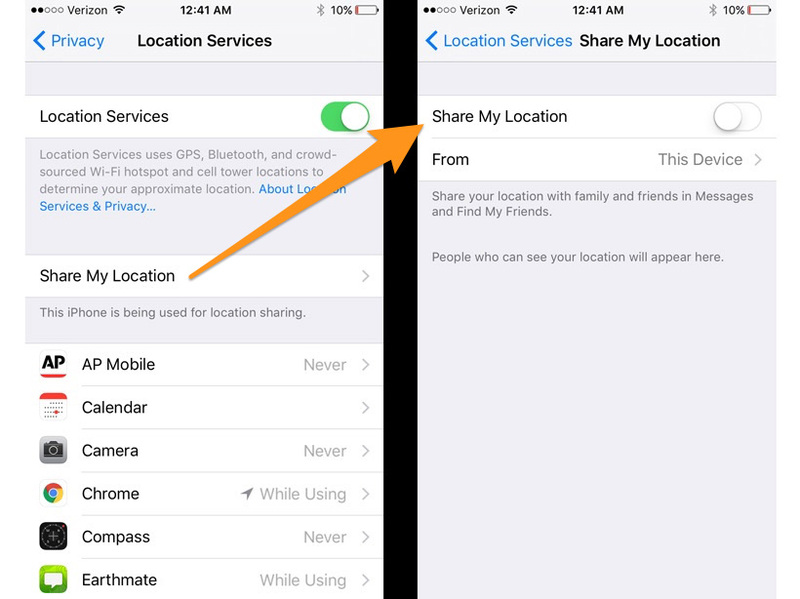 Tap Location Services to enter your phone's location settings. 5. 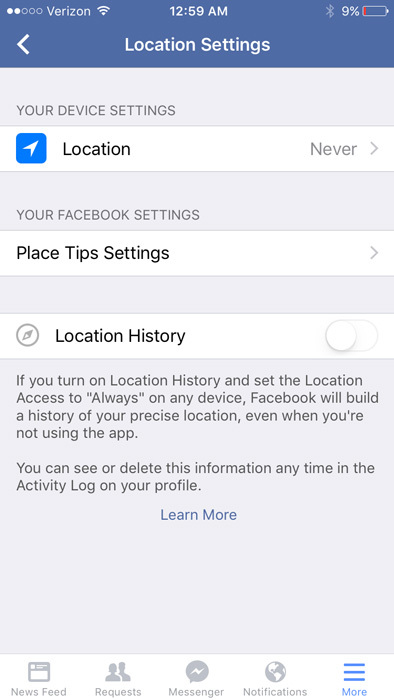 Turn off location services for Facebook. 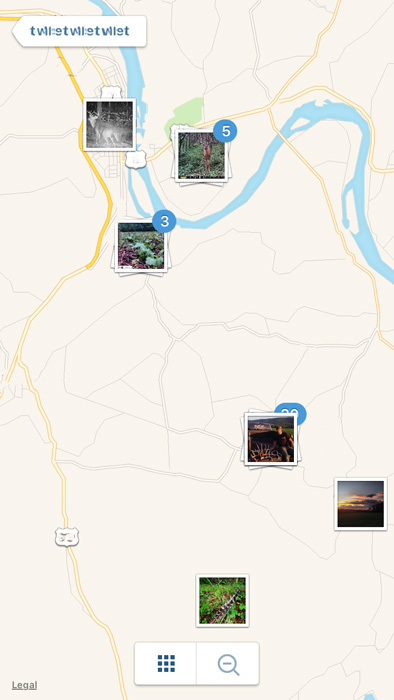 Instagram has a section called Photo Map. This stores the location of your uploaded photos. All someone has to do is go to your profile and click on the map icon to view where your photos were taken. You can find out if your photos have a location attached to them by going to your profile and tapping the Map icon (second from the right). If it is grayed out and you click it, you will get the following image. 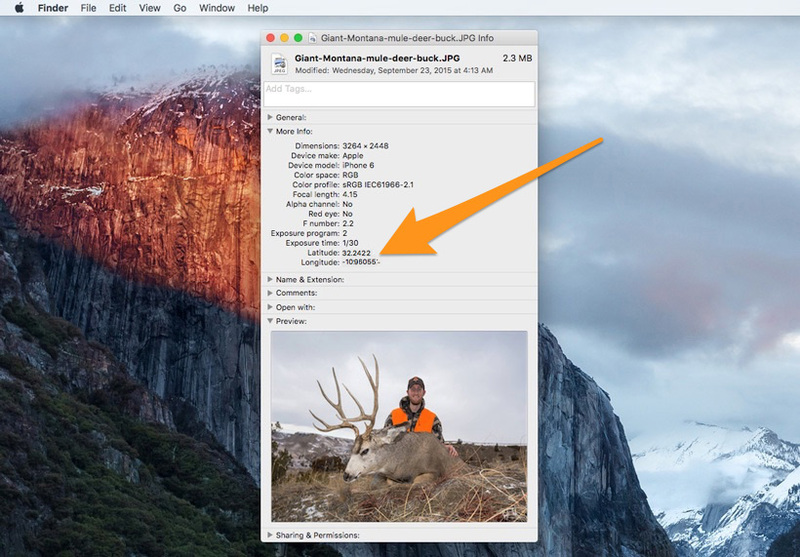 But if you click it and a map shows up with your images… that could mean trouble for your hunting spot. 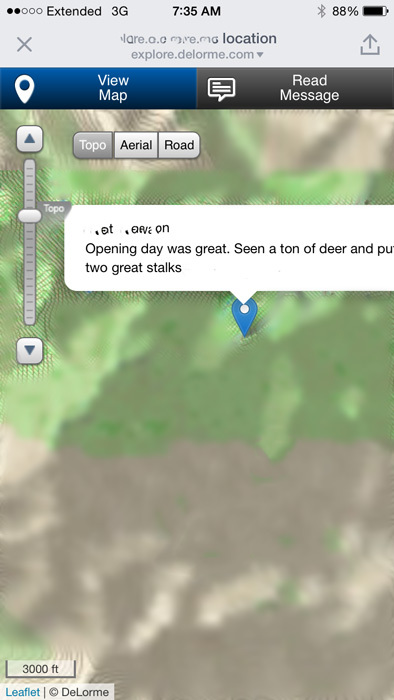 Zoom in even further and you can see how this can be a problem for hunters (especially if you compare the Instagram map with Google Earth). 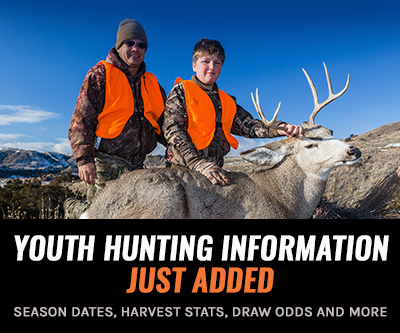 Other hunters can pinpoint the exact location where your photos were taken. You can see how this can be a bad thing for the safety of your family as well when you post photos from your home or announcing your family is going on vacation. 1. Go to your profile and tap . 2. Tap Edit at the top right. 3. Tap the photo or group of photos you'd like to remove, then tap Edit. 4. Tap the photo or photos you'd like to remove or tap Deselect All. 5. Tap Done then Confirm. To prevent photos from being added to your photo map in the future when you post new photos to Instagram, simply make sure that the Add to Photo Map slide is white – if it is blue, that means you're adding location information to the photo. 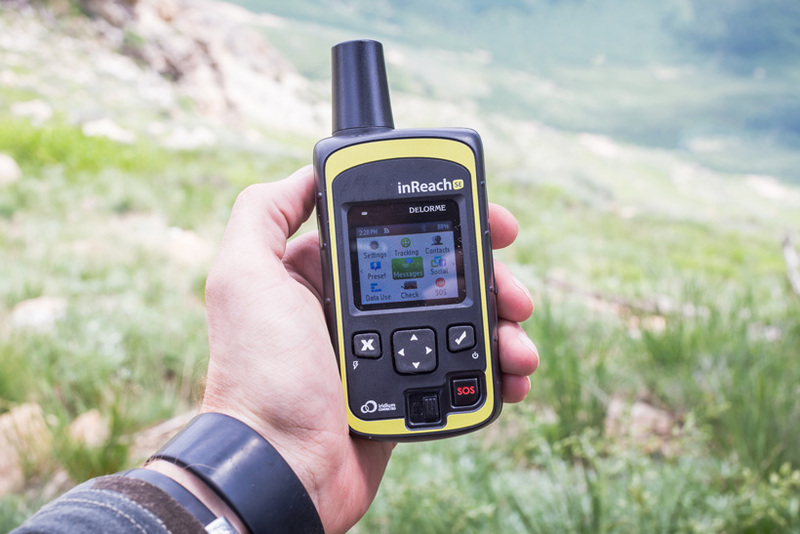 We all want to be safe in the backcountry and tools such as a SPOT messenger or Delorme inReach are perfect devices to inform your loved ones that you are safe. These messengers can also spell trouble if you turn on the Social Media upload features. I witnessed hunters using this feature this past season when I was on a hunt in the backcountry. I jumped on Facebook and saw a group of hunters sharing their daily hunt updates with a satellite messenger. This little bit of information was part of the inspiration to write this article. Screenshot from my phone that is modified to protect their hunting location. Little did they know that their updates were also sharing their GPS location. Later, when they got home, I noticed they removed them all. My advice is to only send satellite messages to people you trust and NEVER activate the social sharing. You might think this seems a little excessive or over the top, but when it comes to your favorite hunting spot that you worked so hard for… why leave it up for chance? You are very welcome, Greg. Glad you found the article useful. Best of luck this season. Great info.....thanks for making me aware.